Here at the Gazette, we’ve picked our Secret Santas, decorated the office, printed our custom wrapping paper, and washed our 1955 red Chevy 3100 truck in preparation for Saturday’s parade — and our gift-wrapping open house afterwards. 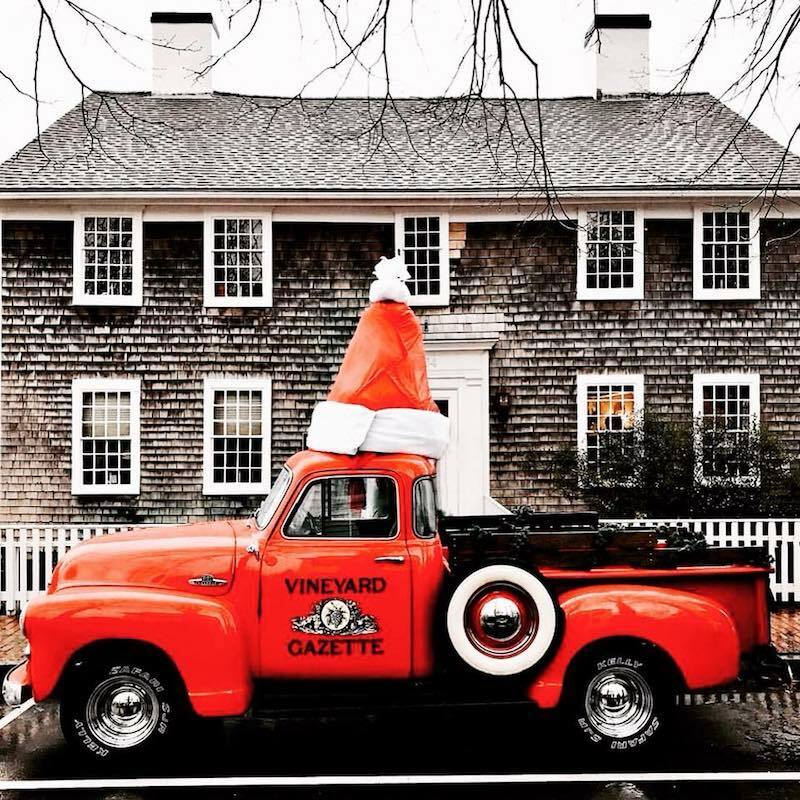 We are possessed with a childlike glee about the holidays—about Christmas in Edgartown festivities, about First Friday shopping in Vineyard Haven, about the light displays in Oak bluffs. And Santa, of course. This week we stopped into both Morning Glory Farm (photo top) and Donaroma’s Nursery (photo left, below) on the way to work to see how they’re getting ready for the big weekend. Morning Glory is swathed in greenery on the outside and sparkling with light and flowers on the inside, a handmade twig chandelier wrapped in tiny lights hanging from the rafters. The staff was setting up the model train village and preparing for their open house on Saturday (hayrides, s’mores, raffles and more). 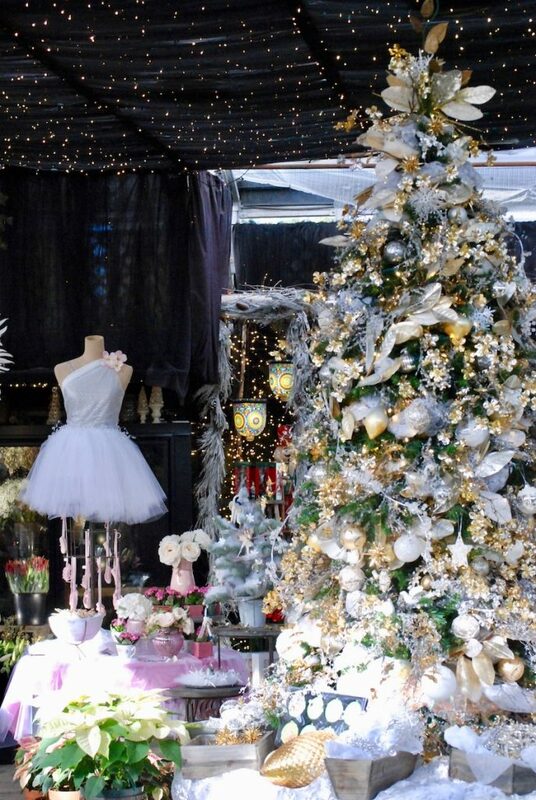 Donaroma’s is a virtual wonderland inside, with an ethereal white tree holding court under a galaxy of twinkling stars. 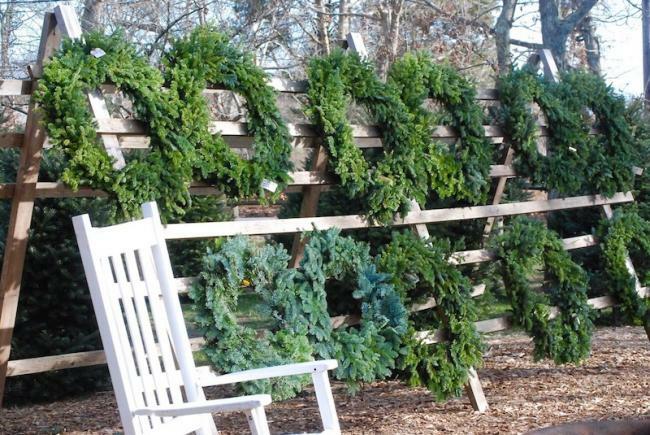 Outside there are dozens of wreaths, tables of holiday greenery and plenty of winter garden decorations as well. On Saturday the talented folks in the floral department will be holding workshops on wreath-making. On Friday and Saturday evenings, the doors will open for the annual Twelve Days of Christmas stroll, benefiting the Boys and Girls Club. We hear Katama General Store is getting ready for their pop-up shop this weekend, Rosewater Market is bringing back cookie decorating again this year, and the Carnegie is setting up a holiday craft-making area for kids in its activity room. Islanders are busier than elves this week. 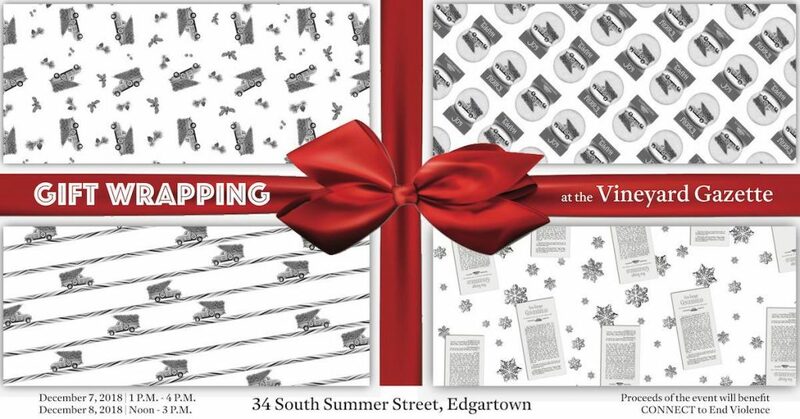 Click here for a complete list of Christmas in Edgartown events. For highlights and more ideas for the weekend, read on. 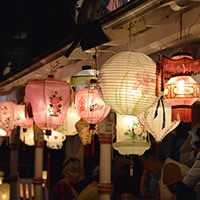 Start the holiday weekend off with First Friday in Vineyard Haven, where shops along Main Street will feature pop-ups by local artists. 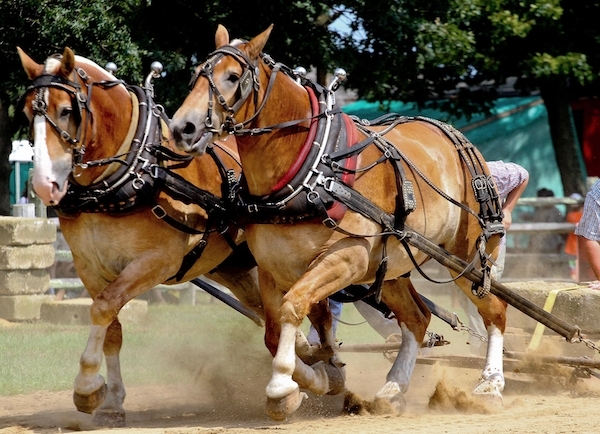 The event, which also features food and live music, runs from 3 p.m. to 8 p.m.
Or, if you’re sticking close to Edgartown, start the afternoon off at Bad Martha’s Season Finale (2 p.m. to 7 p.m.), then head over to Memorial Wharf, this year’s viewing spot for the lighting of the Edgartown lighthouse. Starting at 4:30 p.m., the photobus will be on the scene, ready to take your picture with Santa. The lighthouse lighting happens at 6 p.m.
Tonight the first Minnesingers holiday concert takes place at the Old Whaling Church at 7:30 p.m. Saturday’s performance will be at 4 p.m.
Up at the Aquinnah town hall, a holiday artisans’ sale begins at 10 a.m., while down in Edgartown, the Arts & Crafts Festival at the Edgartown School and the Plum Hill Elves Faire at the Federated Church start around the same time. Don’t miss Handmade from the Heart at the Dr. Daniel Fisher House; the fundraiser benefits Hospice of Martha’s Vineyard. Then grab a good spot on Main Street; the parade begins at 11 a.m.
Sea Salt (1 p.m to 3 p.m.), and check out the Carnegie’s new Island Art Show while you’re there (10 a.m. to 5 p.m.). Don’t miss the Teddy Bear Suite, located this year in Nevin Square and open 10 a.m. to 6 p.m. today. On your way over there, check out Chesca’s front porch event and taste samples of their famous sauces. If you’re up for an adventure this morning, join The Trustees for a tour of Cape Pogue lighthouse at 10 a.m. Or, if you’d rather stretch your legs for a good cause, take part in the Teddy Bear Trot 5K & Fun Run in Edgartown. Take the kids for a hayride in Vineyard Haven; then catch a free screening of Polar Express at the Capawock at 1 p.m. Or head over to the Edgartown Cinema for a showing of Disney’s The Nutcracker in Four Realms in 3D at 3:15 p.m. In West Tisbury, Santa arrives at the fire department at 1 p.m. And the West Tisbury Congregational Church’s Christmas Concert begins at 4 p.m. If you didn’t pop over to Chappaquiddick this morning, you might want to take the ferry over tonight to see Mytoi illuminated for the holidays. The event at the Japanese gardens begins at 5 p.m.